I had a hard time deciding what to call this week’s collection of projects. After sharing my epic quilt shop journey a couple of days ago, I knew I wanted to make it quilt related. The problem is what we usually refer to as quilts and projects that involve the techniques but don’t end up laying flat on somebody’s bed aren’t really the same thing. I’m not saying there’s a line to be drawn there – quite the opposite. If you have a project you want to make that seems a little quilt-like, I vote you let that paper pieced, appliqued, patchwork flag fly. I can’t even count all of the uses I could come up with for these Organizer Baskets from Pink Penguin. Many, many years ago I made a wall hanging with a seasonal square for each month. I loved it, but I don’t know what happened to it. I think it’s time for a new one, starting with this pattern from Quiltmaker. Now I want to make these cute Quilted Recipe Binder Covers from Happy Quilting for every one of my recipe binders. If you want to try out piecing on a tiny level, this Sew Pixel Play Pincushion from Easy Patchwork is a great place to start. This Cherry Blossom Block from Quilting Digest makes me yearn for summer. Wine and quilting go hand-in-hand. Right? Well, maybe not if you like things straight and such, but there’s always the after party. This Quilted Wine Tote from Needle and Spatula would be a great way to share the “hey, I just finished something” celebration with a friend. There isn’t exactly a whole tutorial for this Scrap Happy Apron from Crazy Mom Quilts, but it would be pretty easy to figure out. Just for fun, say the name of her blog out loud three times, putting the emphasis on a different word each time. 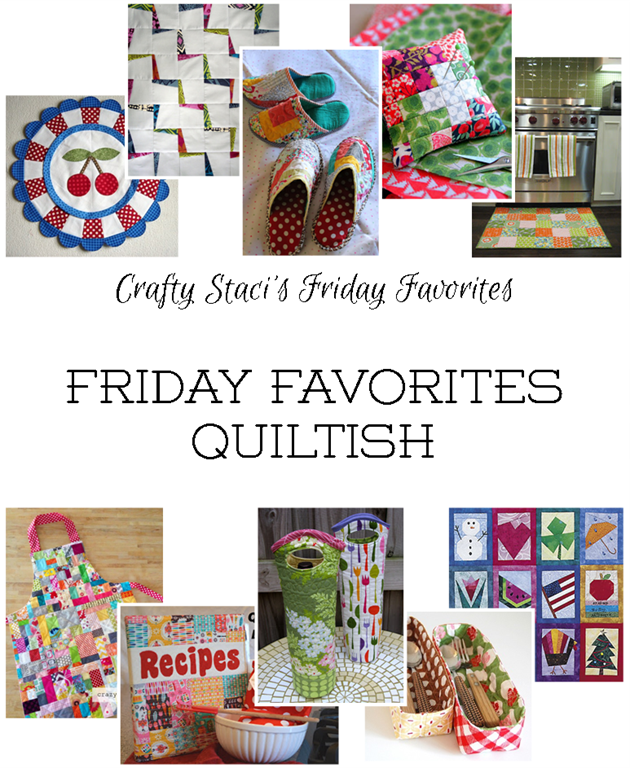 My favorite is Crazy Mom QUILTS. I’m so easily entertained sometimes. The best part of this Quilted Kitchen Floor Mat from Sew We Stitch is that you could make it as padded as you’d like. And that it would be easy to throw in the wash. And it’s cute. And you could make it match your kitchen…. I think DIY shoes must be a thing right now, because I keep seeing them everywhere. These Patchwork Slippers from Through the Window use a fabric and batting sole, but I just saw that you can buy hard soles to make these as well. I keep picturing this Lightning Zigzags Quilt from Jenn of All Trades in space or dark sky fabric with yellow lightning bolts. You could also go red and yellow if you happen to have a Flash fan in your life.